Something weird is going on at our house. The pictures illustrate the recent events. Oscar is sleeping in Stewie's bed and Stewie is eating Oscar's food. Even stranger... the other just stands by... "Oh fine, I'll bunk in your bed then." "Having a snack? That's okay... I'll just wait til you're done." It's like Freaky Friday but with pets instead of Barbara Harris and Jodie Foster. I just have to say I LOVE the animal love that goes on in your house! My cats can barely stay in the same room together... yay for inter-species friendship! My brother in laws pets do the same. Heh heh. Have you ever wondered what they do when your not looking...(too bad you dont have a webcam setup). Uh oh, it looks like Stewie is the alpha-dog now. Pets don't usually share their food, do they? hilarious. i just have two pugs, but they both have their spots, and it's odd when one takes the other's place. LOL Poor Oscar, he doesn't exactly fit in Stewie's bed does he?! Stewiw does seem to be in charge in their little animal world. Oh my! My boy kitties swap beds all the time. I got these beds (see picture here) from Target. 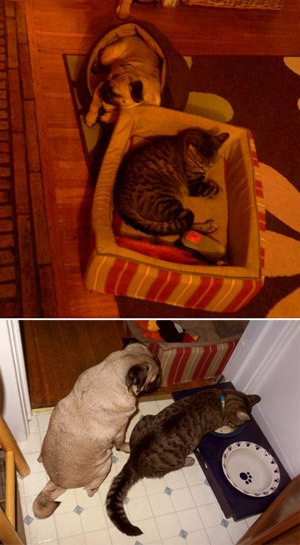 They're "small dog" beds which fit perfectly to the average kitty's body size.